Love is about being together. You may have heard that making yourself too available can damage a relationship. Perhaps you’ve even decided that the reason a past relationship failed was because you were just “there too much.” However, that might not be the case. In fact, if two people want to be in a secure and loving relationship where both partners feel safe to be open and vulnerable rather than guarded, then being available can bring the couple closer. Loving is an art, explains psychologist Erich Fromm in "The Art of Loving." To have a true, loving relationship, both people have to be ready, willing and able to give and receive love -- and when they’re not, that’s often why the relationship fails. In "Love's Executioner," Dr. Irvin Yalom states, “…two-broken winged birds coupled into one make for clumsy flight. No amount of patience will help it fly, and ultimately, each must be pried from the other and wounds separately splintered.” What Dr. Yalom is saying is that to have a successful relationship, both people have to be ready for love. It’s not unusual for a person to say that he truly wants to be in an intimate relationship only to find that he’s consistently disappointed and frustrated with love because he’s just not ready for it. To love someone genuinely, you first have to love yourself, notes Dr. Fromm. 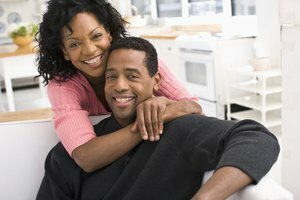 If your partner has a secure sense of himself as a lovable person, he’s likely to want you to be available. If he doesn’t, then it might be because he’s conflicted about taking the emotional risks necessary to be in an open, healthy relationship. Moreover, if he feels unlovable, it will be nearly impossible for him to risk genuine, romantic love. If either partner is unavailable, scared, or not ready, then it is inevitable that being too available will hurt the relationship. However, if both people are ready and open, then being available makes for closer, more satisfying bonding. Shame can create problems in relationships, notes psychologist June Price Tangney in "Shame and Guilt." If a person has difficulty embracing and accepting her own natural vulnerabilities, then she may find another person's ability to be vulnerable as shameful. Being hurt in the past, either during childhood or in a previous close relationship, can make someone more prone to feeling shame, according to Dr. Tangney. When someone complains that a partner is too available, she may simply be terrified of his ability to be vulnerable. For a reciprocal loving relationship to evolve, both partners have to be vulnerable -- and if they are, then being available is a good thing. Unless both partners allow themselves to be open and vulnerable, they will never have true intimacy. Intimacy is the ability to commit to another person and follow through with the compromises that this type of attachment may entail, notes psychologist, Erik Erikson in "Childhood and Society." Being able to form trust in a relationship is necessary for intimacy. Of course, opening your heart to someone can be very scary at first, but it's well worth the risk. Without opening yourself up to another person and leaving yourself vulnerable for hurt, you will never get to experience all the positive feelings that can happen when being truly intimate. Being available does not mean giving up your own interests, friends and independence for another person. You want a relationship where you can remain your own person while being with, and available to, someone else. In fact, the more secure and independent you are, the better your chances of having a healthy satisfying relationship. In "The Art of Loving," Dr. Fromm explains that if you are attached to someone because you can't stand on your own feet, then that person is a lifesaver, but the relationship is not one of love. You shouldn't have to play the "I’m not available" game to keep someone interested. If a partner or potential love interest claims that you’re too available, chances are that he's the one who is not available -- and attempting to get an unavailable person to be available by playing games will ultimately end in heartache. Save yourself from this spiral by being confident, secure and independent -- and by seeking someone who has those same qualities. Jacqueline, Dr.. "Does Being Too Available Hurt a Relationship?" Synonym, https://classroom.synonym.com/being-available-hurt-relationship-19229.html. Accessed 18 April 2019.